The WAY - Man is lost, and the world is as much of a wilderness as the sands of Arabia to a traveller who has lost his way. The Lord Jesus Christ came to seek and to save the lost. Jesus says, "I am the Way," and it is sure, unfailing. He is the Way. We have nothing to do but to take the way. The TRUTH -The truth is the revelation of God, the manifestation of everything else, in Christ. In short, He manifests every one and every thing exactly as each is. The LIFE - How deeply we need the life of Christ, in order that we may live to God, How plain it is that the whole practical walk of believers flows from life in Christ, God declares that He has given me, if a believer, another nature, new life in Christ. Nicodemus had to learn that he not only needed to hear what Jesus had to teach - he needed to be born afresh and have eternal life. 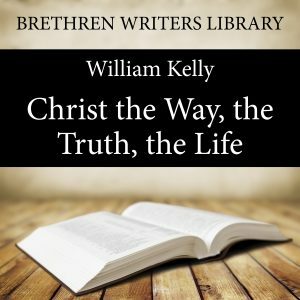 A word about the Author : William Kelly (1820 – 1906) was born in Millisle, County Down, Ireland. Left fatherless at a young age, he was educated at Trinity College, Dublin where he excelled. Much of his life was spent in Guernsey and then Blackheath near London.He is well known for being a friend of John Nelson Darby and editing many of his books. His supreme delight was in ministering in spiritual things to those whom he described as ‘the few despised ones of Christ's flock’. For many years he edited the ‘Bible Treasury’ which is still in print today.